The path to veganism chose Morathi Howie. While at North Carolina Central University in Durham, he was headed to the cafeteria for "chicken Wednesday" with a friend when they informed him they were vegan. "What do you mean you don't eat meat?" he recalled of his incredulous reply. After a long talk with his vegan friend, he returned to his dorm room, mulling the conversation over in his head. "A lot of things that he said just made so much sense and it resonated in my spirit, and so that's what led me on my path," Howie explained. That's when he decided to make the switch to a plant-based lifestyle. He grabbed some friends to take him to Whole Foods around the corner and help him make informed decisions about his new vegan diet and lifestyle. "Then my journey went from there and I never turned back," he finalized. In 2006, he moved to Zimbabwe on a whim with a friend. To try it out, he decided he would stay at least 30 days, but those 30 days turned into 11 years. 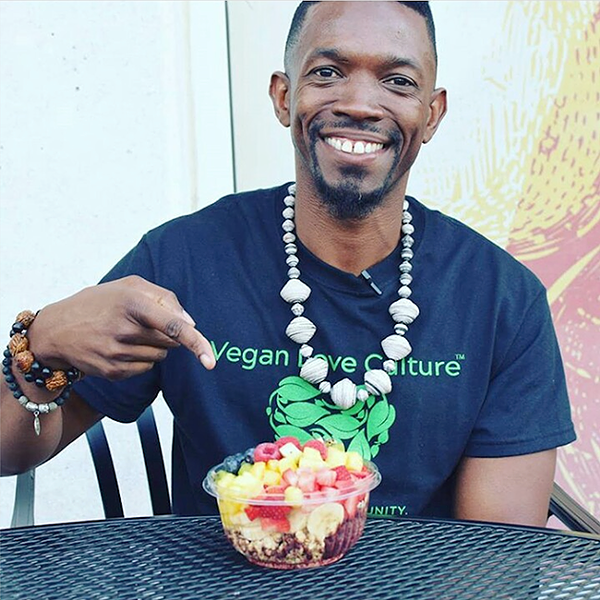 Through the company he was with, he spread the vegan lifestyle to Zimbabwe's population by importing vegan food from stores in South Africa. 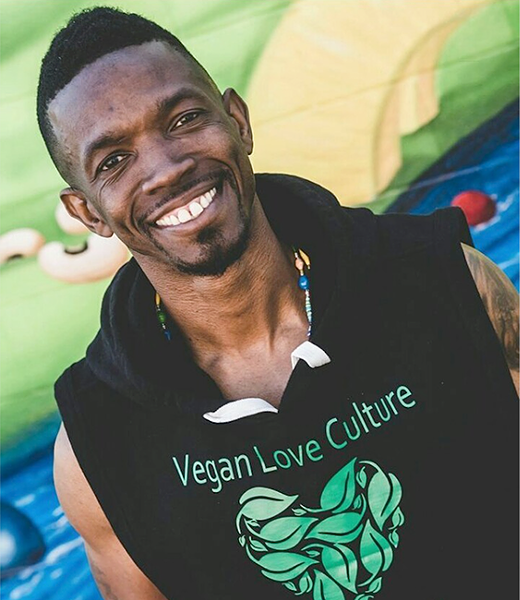 In 2017, he returned to the United States and is now the CEO of Vegan Love Culture, a company dedicated to helping people switch to the vegan lifestyle to heal their bodies and the earth with a healthier diet and life. Now, 20 years after his switch, Creative Loafing caught up with Howie as he sat in a swanky University-area wine shop. He wore colorful paper bead necklaces around his neck and a T-shirt from Vegan Love Culture. At the upcoming Charlotte VegFest 2018 on Oct. 13, Howie will speak on a panel about vegan parenting. We discussed the environmental benefits of the plant-based lifestyle and how intimidating it can be to go vegan. Creative Loafing: What kind of impact do you expect VegFest 2018 to have on the Charlotte community? Morathi Howie: Anybody that been paying attention will see that veganism has taken a quantum leap jump from just a year ago. Everywhere you look, everyone is talking about going vegan. I mean it's a cool word to say now. There are a lot of people that have a lot of questions about this lifestyle. Some people have really, really taken this word and they complicated it for people and it needs to be simplified. By coming out to the vegan fest, it will be simplified for you. You get a chance to go around and you get a chance to go to each vendor spot. There will be over 75-80 vendors speaking on different things dealing with veganism. And you can get a clear understanding on what the lifestyle is about all the way from clothing to preserving the earth, to preserving animals and your health. So by coming out to this event, not only is it going to do that, but there's a lot of [division] going on in America. One thing about the vegan lifestyle, it brings people together. You get me? And we need that very, very badly in America and in Charlotte. We're saying everyone needs to come out, this is a diverse event, it's going to be family-friendly, it's a free event, you can come out, learn about this lifestyle. I'll be out there on the panel for vegan parenting to speak about how you can help your children to become vegan. We'll have different cooking demos that will be going on while there will also be vendors there; soulful vegan food, Thai vegan food, Jamaican vegan food, just different types of vegan food that people can taste. So they can be like, "OK, I thought it was all about eating just vegetables," but there's a way that you can eat whatever you want and it can be healthier for your life. I'll definitely say, to encompass everything, there's going to be a lot of love and unity to a lot of people and we really need that in this time. What kind of environmental benefits does veganism have? I do what you call a "Meatless Monday Movement." Meatless Monday has been going on forever. I just call it Meatless Monday Movement, where people that know me and follow me, I encourage them to go meatless just for one day out of the week. For health, for what it does for the environment and for what it does for animals. Let's take for example, if someone goes meatless, Meatless Monday, they just do a meatless Monday. They preserve so much water on a daily basis that's being used to feed cows. They preserve so much of the Earth and so many of the crops that are being fed to the cows. It stops so much of the gas emission that's going out on the daily basis that's destroying our environment. So by going vegan, you literally save the planet. You literally save the earth. That's basically what you're doing. By taking the plants that come from the earth which grow year round you're saving the planet. That's basically what they're saying. How can a non-vegan begin to approach this lifestyle if they are unsure if it's for them, personally? A lot reasons why a lot of people follow me is for the reason that I never would shove this life down anyone's throat. Because first of all, for me, being a vegan, I wasn't vegan all my life and I put myself in other people's shoes. I used to love the Whopper, I used to love McDonald's I used to do all of that. I put myself in their shoes and say, "One day at a time, with urgency." No one understands that if you go on into this lifestyle, that once you go into it, it's going to help you to become more healthier, but at the same time, you take your time. For people that are feeling kind of hesitant because they feel like they're being judged by the vegan community, which I think happens a lot, I would tell anybody that if you come out to this fest you will run into more vegans and non-vegans that are very, very friendly people that will talk to you. They're not going to shun, you they're not going to tell you you're wrong for what you're doing, and they will give you assistance in how you can become vegan. But I would tell most people that are meat eaters do Meatless Mondays. Start off with Meatless Monday, just take out some time, even if you want to incorporate the whole month or the whole year or whatever, carve out some time for you and the family, or yourself and make meatless meals on Monday. While you're making these meatless meals find out what accumulation is for your body. Because we accumulate bad health. The same way that we accumulate bad health we can accumulate good health. So I would tell someone to start off with Meatless Mondays. That is that. And then seeing where that road takes you, you may not become a full vegan. You may say, "Well you know what? I do care about this environment, I do care about animals, I'm a dog lover. Why am I doing this to cows? They're the same spirit being as a dog. Why am I doing this to chickens?" It may wake them up to give them a better understanding. So it's really about information more than anything to make someone comfortable to be able to go into the lifestyle.